New Winter 2018: It's a special joy for both generations when grandmothers and kids get together in the kitchen to make holiday treats! 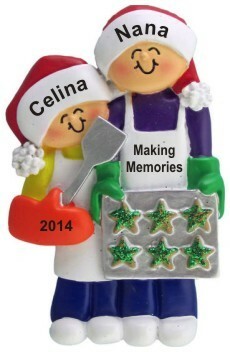 Capture precious memories of these wonderful moments with the baking cookies with Grandma 1 child personalized Christmas ornament. This adorable grandparents ornament can be customized with the details you provide. They'll be painted on by hand in a pretty font, and there's room on the back for us to add a longer message, at your option. The grandma and child baking cookies Christmas ornament personalized as a cherished keepsake arrives in our plush velvet gift and storage pouch, a gift from Russell Rhodes. gift for grandson Dec 28, 2016 Brenda P.
For my mom and my daughter Dec 27, 2014 Theresa L.